Beginning January 1, 2020, the California Air Resources Board’s (CARB) Truck and Bus Regulation will be enforced through a new automatic process. Senate Bill 1, the Road Repair and Accountability Act of 2017 (SB 1), was signed into law on April 28, 2017. This bill states that the California Department of Motor Vehicles (DMV) must check that vehicles are compliant with, or exempt from, CARB’s Truck and Bus Regulation. The new DMV compliance verification process will better enforce the regulation and level the playing field for businesses throughout California. If a vehicle is not compliant with the rule, DMV will no longer register that vehicle, starting January 1, 2020. 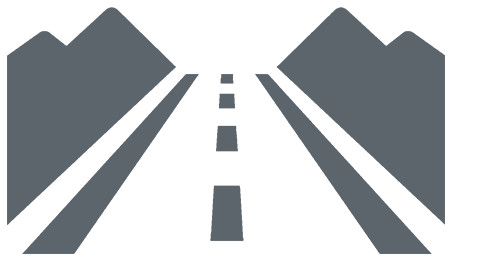 CARB has developed the Excluded Diesel Vehicle Reporting (EDVR) System as a tool to assist vehicle owners who have had (or will have) their Department of Motor Vehicles (DMV) vehicle registration denied incorrectly. Vehicle owners may need to use this system if their vehicle falls under specific categories that will need to provide further proof to show that their vehicle is in compliance with, or exempt from, the California Air Resources Board (CARB) Truck and Bus Regulation. Submitting documentation that is complete, legible, and accurate at least a month before your registration due date is the best way to avoid the need to pay a fee to DMV for a temporary registration permit. Submitting documentation that is incomplete, illegible, and/or inaccurate will result in this form being rejected. 13 CCR § 2025(z) states: “Any person…who knowingly submits any false statement or representation in any application, report, statement, or other document filed, maintained, or used for the purposes of compliance with this regulation may be subject to civil or criminal penalties under sections 39674, 39675, 42400, 42400.1, 42400.2, 42402.2, and 43016, of the Health and Safety Code. The Regulation applies to nearly all diesel-fueled trucks, buses, and school buses with a gross vehicle weight rating (GVWR) greater than 14,000 pounds. If your vehicle is exempt from another heavy-duty diesel regulation (ex: solid waste collection vehicles, drayage trucks and cargo-handling equipment), it is likely subject to the Truck and Bus Regulation. The rule is based off the year of your current engine(s). 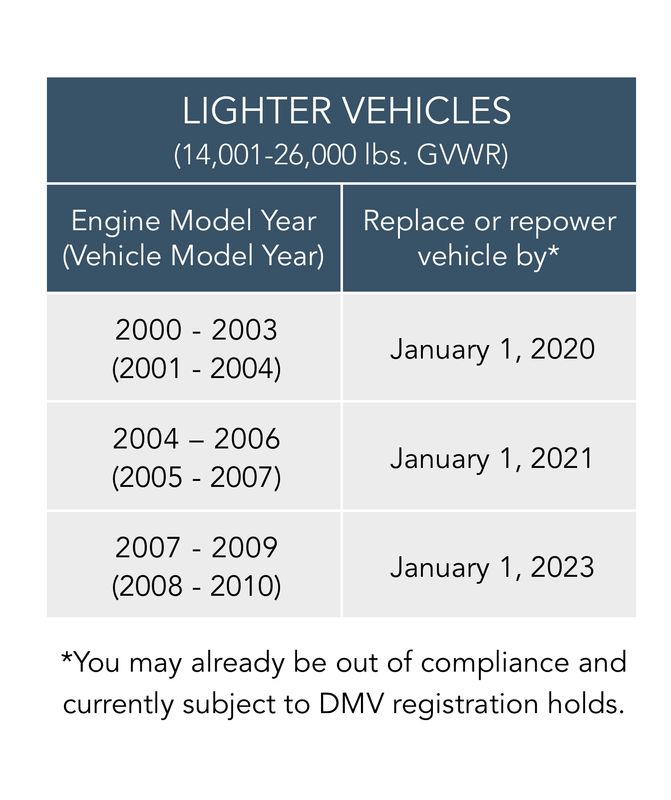 Your older vehicle will need to be replaced or repowered with a 2010 or newer engine following the schedule below, unless it is exempt from the Regulation. Engine model years are typically one year behind your vehicle model year. There are also filter requirements for larger vehicles. You will need to retire or repower your 2009 or older engine based on the compliance schedule below. There are two schedules, one for lighter trucks and buses and one for heavier trucks and buses. Look on your vehicle to determine the GVWR. See the compliance schedule below for details. Low-use vehicles are vehicles that travel less than 1,000 miles per year, including vehicles that are not operated (even if they have a non-op registration). A vehicle that travels more than 1,000 miles annually can use the low-use vehicle exemption as long as it operates less than 1,000 miles within California each year. The low-use option allows the vehicle to be exempt from PM filter and engine replacement requirements. Annual odometer reporting is required. Annual reporting in the TRUCRS reporting system is required to demonstrate compliance with this option. Vehicles that are operated in certain areas of the state with cleaner air may be eligible to use the NOx Exempt Area Extension to phase-in PM filter retrofits. Beginning January 1, 2020 vehicles can remain under the NOx option and avoid vehicle replacement or upgrade the vehicle based on the engine model year schedule. Annual reporting in the TRUCRS reporting system is required to demonstrate compliance with this option. Truck and bus owners need to take action today to understand the compliance phase-in schedule and the limited remaining options available in order to stay in compliance before their DMV registration is denied. They should also know that even if they are in compliance today, they may need to take action down the road to remain in compliance. If you know you are already out of compliance now, you will not be able to wait until 2020 to take action. CARB is ramping up enforcement today and has issued over 10,000 DMV registration holds this year alone. There are several funding opportunities offered by CARB, including incentives for zero-emission trucks and buses or loan assistance for purchasing newer vehicles or engines. The loan program helps small fleets, owner operators, and other businesses get the financing they need to upgrade to cleaner, lower-emission vehicles. Light vehicles (14,001-26,000 lbs GVWR) with Engine Model Year 1999 need to be replaced or repowered to a 2010 or newer model year engine. 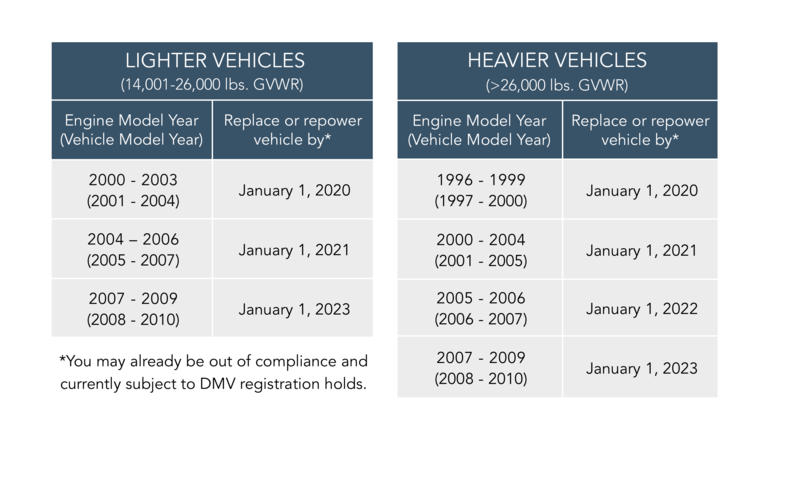 Light vehicles (14,001-26,000 lbs GVWR) with Engine Model Year 2004 or older need to be replaced or repowered to a 2010 or newer model year engine. 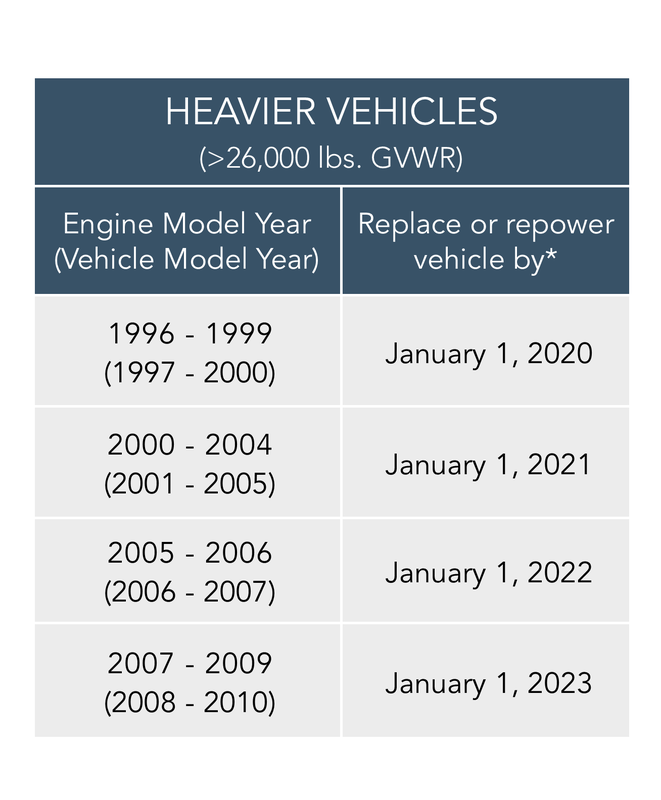 Heavy vehicles (Greater than 26,000 lbs GVWR) with Engine Model Year 2000 or older need to be replaced or repowered to a 2010 or newer model year engine. Copyright © TruckStop. All rights reserved.